If you do not have a toaster at home yet, you are missing out on a great product. If you think that toasters are only used for making toasts for breakfast, then you are totally underestimating its capabilities. 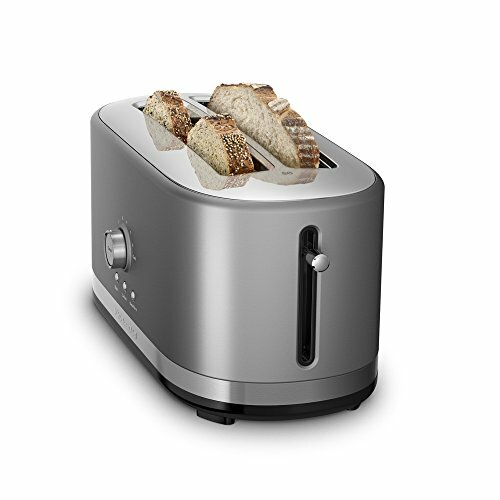 Here are the top ten toasters that we recommend. 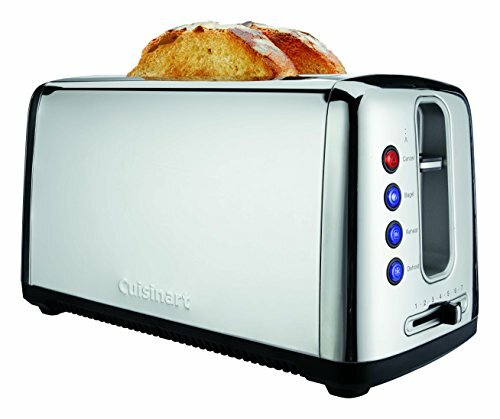 This handsome toaster is made by Cuisinart and has a brushed-stainless steel exterior. 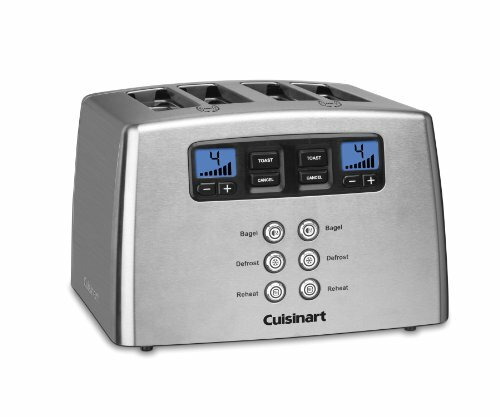 There are four 1.5” wide slots for toasting, with bagel, defrost, reheat, and cancel buttons. It also has six-setting browning dials. It’s 11.88” x 11.06” x 7” in size. 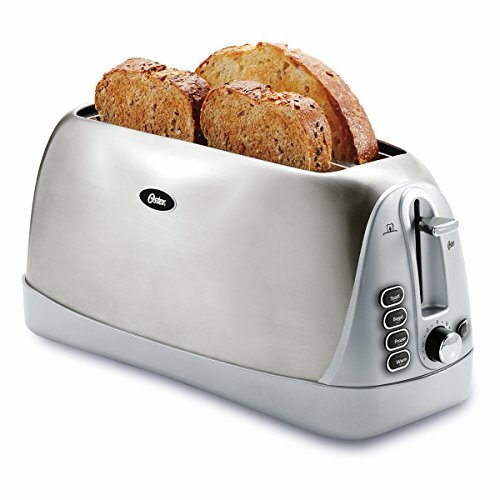 You can toast four slices or two bagels at once with this silver and stainless steel KRUPS toaster. There are cancel, defrost, reheat, and bagel buttons, as well as six-setting browning dials on both the left and right sides. The slots are 1.5” wide x 5.75” long. The entire toaster is 13.5” x 13.3” x 8.6” in total size. 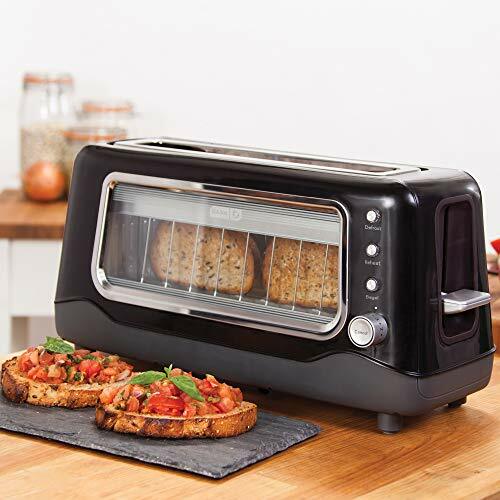 With this four slice toaster, it has a narrower design so that two pieces of bread fit side by side. Each slot is 1.5” wide by 10.5” long. It has seven toast shade settings, and a removable crumb tray. It also has toast, bagel, frozen, and warm buttons. The toaster is 7.3” H x 6.9” W x 16.6” D and weighs 4.98 lbs. 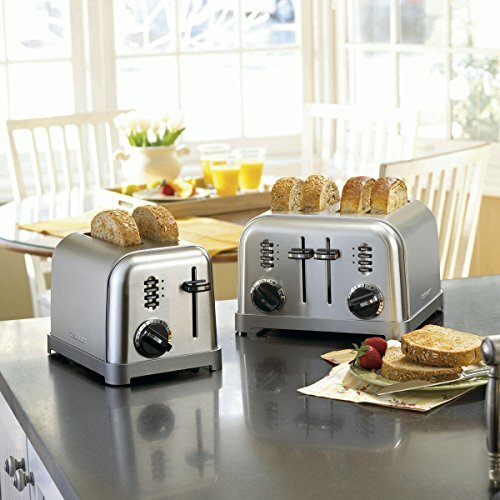 This traditional toaster has a brushed-stainless steel exterior with red, black, or steel sides and four extra-wide slots for toast or bagels. 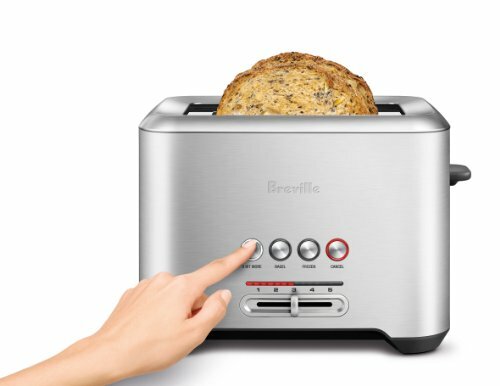 It has five shade settings for toasting, and two buttons for cancel or bagel. It also comes with a crumb tray. This Cuisinart toaster comes with a blue backlit LCD countdown feature which shows you how much time you have left before the toaster is ready. It has bagel, defrost, reheat, and cancel buttons. The slots are 1.5” wide, and there are seven toasting settings. This toaster is 12.6” x 12.3” x 9” in size. 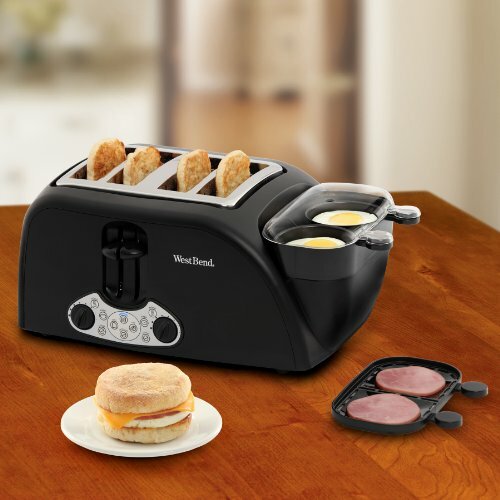 Cook an entire breakfast in one go with this egg and muffin toaster. It includes four slots for toasting bread or bagels and a built in egg cooker on the right-hand side. You can scramble, poach, soft or hard boil eggs. There’s also a meat tray to warm up meat. Buttons help you decide what you want to cook. It’s 12.4” high x 19.5” wide x 10” deep in size. This Dash clear view toaster looks like a miniature toaster oven, since it has a clear glass window to view the toast while its toasting. There’s a 7-level browning control dial, defrost, reheat, and bagel buttons, and a high-manual lever. You can buy it in red, black, or white colors. It’s 16” x 8” x 5.8” in size. This full stainless steel toaster has two extra-wide slows, buttons for bagel, frozen, and cancel, and five settings for browning. It also has a special “a bit more” button if you’d like to toast the food a bit more. The ready alert button can be on high, low, or muted. This toaster is 11.2” x 8” x 7.8” in size. 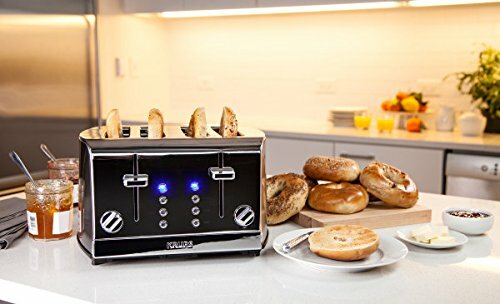 With cancel, bagel, reheat, and defrost settings, this artisan bread toaster has extra-large dual slots that are 1.5” wide and 10” long. The outside is chrome with a high-lift lever, and the slots are self-centering. It also comes with a crumb tray. This toaster is 16.2” x 8.8” x 8.5” in size. 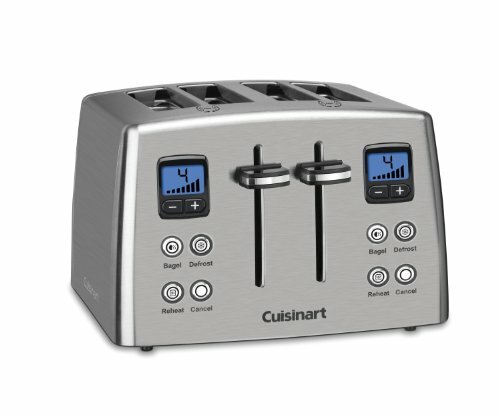 This Cuisinart toaster is the same model as the previous Cuisinart model on this list, but in a newer version. It also comes with the blue-backlit LCD countdown feature showing you how much time you have left before the toaster is ready. It has the same bagel, defrost, reheat, and cancel buttons. The slots are 1.5” wide, and there are seven toasting settings. This toaster is 12.6” x 12.3” x 9” in size.